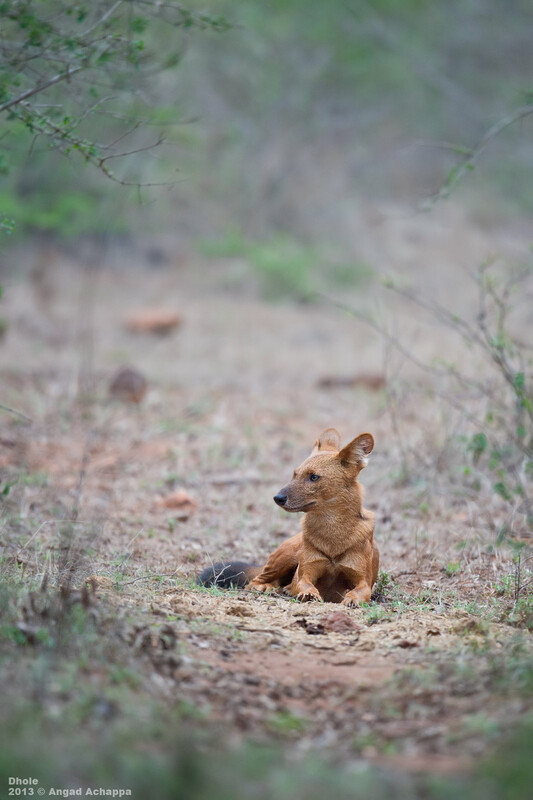 The Dhole, also know as the Indian Wild Dog is one of the most successful hunters from the Indian Forests. They have been placed under the 'endangered' category by IUCN due to loss of habitat and possible transfer of diseases from domestic and ferral dogs. They are highly social animals, and hunt in packs, often chasing their prey to exhaustion. They often start tearing into their prey even before it is dead. Since they often travel in numbers, they are bold enough to take on much larger animals, like gaurs, sambhars and often chase tigers and leopards away. Here, after finishing an evening safari at Bandipur National Park, while returning to our lodge around 6:30 PM, we came across two dholes sitting right next to the highway. The light was quite low, and I was thrilled at trying out a few High ISO shots with the D3S. Here is one of them. For info on wildlife photography in India, feel free to drop in a mail, or leave a message on my Facebook page mentioned below. Great shot and focus on the wild dog! I have seen these dogs only behind caged in zoo. Cool and calm picture of the Indian wild dog. Spectacular click! wonderful wildlife account. I glad found your interesting blog, but also hope, give few rich sec at my blog. Interesting post and a great shot of the beautiful dog. Damdama Lake Gurgaon is a best place for Adventure activities, Boating, Games and Events etc. Wonderful shot and beautiful encounter Angad!